Sunday night brought to an end the "pre-season" component of the exhibition season. Sask never even posted a score on this one. It only got tweeted in response to a question! This game brought the curtain down on The Rutherdump. May it R.I.P. So York goes 0-3-0, even losing to last-place Regina. One has to wonder about their prospects for the season. Sask ends the pre-season unblemished at 4-0-0. REGULAR SEASON STARTS SEP 28-30! The regular season kicks off in the CW and the AUS this week, whilst the OUA gets in one more week of non-conference/exhibition play. Last year, Calgary had the 3rd best record in the CW, but use of an ineligible player early in the first half of the season cost them 8 points in the standings, and had them slump to 5th. The Bisons capitalized and claimed 3rd place. The regular season was considered a disappointment in the Town of Bedrock last year. They had a much ballyhooed recruiting class, that never seemed to get on track. They are once again a highly touted team, but I say let's wait and see. In pre-season the clobbered MacEwan from the ACAC twice, split with MRU, and beat Alberta. That would suggest they are capable. The Bisons are becoming somewhat less typical, recruiting more and more small, quick players all the time. IMO they need some size in their defence this year. They were often exploited there last year. I have seen just their lone home exhibition game, and they did handle Regina well. The Dinos, however, are a much different side. Losing four good players who were eligible to return (St. Croix, Laurencelle, Lisoway, and Heinrich) has hurt the Bisons. The T-irds rebounded with a strong end to last season, and therefore have optimism on their side. The Hŏrny Ōnes seem to be spinning their wheels despite hosting this year's U-Cup. UBC always seems to rise to a certain level and then stop. The Cat fight is on right away! The Bluegars host the series. Regina had just 4 exhibition games, and were 0-2-0 against CW teams. MRU had just 3 games, the lightest schedule in the CW. Regina was very much the doormat of the CW last year. They still appear to be the weak sister, but have been finding some solid recruits. This series goes Saturday and Sunday, instead of Friday-Saturday like the rest. These were two of the top four teams in Canada a year ago, and both are touted to be as good as they were a year ago. Personally, I believe that the Mutts lost a lot, not easily replaced with new recruits. Still, they had the best pre-season record of any USports team. Sep 29 Saint Mary's at St. F.X. The Bisons gave up early goals in the 1st and 2nd periods, but by the end of the 2nd period had found their form to tie the game at 2-2. One goal came from a veteran (Brett Stovin) and one from a rookie (Devon Skoleski). The stage was set for a good 3rd period, however the Dinos took control with three unanswered goals. Jordan Papirny got the win (with 14 saves) and Byron Spriggs took the loss (with 34 saves). The rematch goes Saturday at 2:00 MDT, 3:00 CDT. The series does not start until Saturday night, but I found some links about these two. Each has a season preview from a local paper. And we have a disturbing story from the CBC. I fear you'll see men with lipstick in women's sports. If they've had the operation, that's one thing. If not, that's another. I wonder how many Cougar fights there were on Friday night? Most were likely more closely contested than this one. The Banjo Cats had kudos for their recruiting class, however that may have been just glorified catnip. Colton Kroeker had two goals for the Bluegars and Tyler KIng had two for the Green Cougars. The rematch is Saturday at 3:00 MDT, or 4:00 CDT. Before we shed tears for the Horny Ones, They outshot the T-irds 40-33, including 19-7 in the 3rd period. UBC was led by Michael Stenerson and Carter Popoff, with two goals each. Ryna Toth stopped 36 shots for the win, and Garret Hughson took the loss. The rematch is Saturday at 1:00 MDT, 2:00 CDT. Whenever a team makes a trip to the Town of Bedrock, a split is considered a decent weekend. So that aspect of the weekend should make Bison fans very happy. However, was this a case of capitalizing on a shaky goaltender? Matthew Greenfield stopped just 11 of 15 shots before an empty-netter closed the scoring. Oddly, this was the night of the players whose last name starts with "S". Skoleski, Skrumeda, and Stovin led the Bisons to a 3-0 lead by the 2nd period. Sydora started in place of Spriggs in goal, and stopped 32 of 35 to get the "W". Sheen (with two) and Shearer scored for the Dinos, and Stovin's empty-netter closed the scoring. The only non-S contribution was from Brooks, whose 3rd period goal gave the Bisons a 4-2 lead which lasted until the end of the game. Stovin and Skoleski also scored on Friday night. I'd like to see them focus on Stovin's offensive side this year. When PP and PK were out there a fair bit, the 4th line and Leblanc had very little ice time. Next weekend the Bisons are off to the Excited States (North Dakota and Omaha to be precise), before opening at home against the Alberta Evil Monkeys on October 12th and 13th. The Dinos, meanwhile, will muse over their pending extinction whilst relaxing with a bye week. Indeed, it is hard to sweep a team. The Bluegars had it all their way on Friday night but this matinee was a lot tougher. Last season, the Banjo Cats seemed to throw in the towel once the losses were piling up. Let's see how they handle this season. They acquired some better players but are still at least a notch behind most CW teams. In this one, pair of PP goals kept Regina in it. Riley Morris stopped 19 of 21 to get the win, and Dawson MacAuley stopped 33 of 36 to suffer defeat. 3rd year defenceman Jesse Lees scored the OT winner, his 2nd point of the night. It is never easy to sweep on the road, even in Lethbridge. So the T-irds must be thrilled with the sweep. In an interesting stat, over the series the Hørny Ønes were 1-for-11 on the power play and UBC was 5-for-10. Both sides switched goaltenders, giving a rookie his debut. Patrick Dea stopped 29 of 31 for the win, and Taz Burman stopped 45 of 48 at the other end. All season long we will be contemplating what a massive upset it would be to see Lethbridge upset a conference champion when they host the U-Cup. It was funny that every other team in the CW had two games under their belts before these two teams even stepped on the ice for game 1. This was a special night for the Apes. As defending conference and national champions they had banners to raise. They were scratching their armpit with one hand whilst holding a banana in the other, taking an occasional break to swing from the other banners at the Clare Drake Arena. The celebratory mood seemed to lift the Monkeys early on, as they mounted a 2-0 lead with goals in the opening minute of each of the 1st and 2nd periods. From there it was all downhill, as five different Mutts helped put the boots to the Primates. In net, 2nd year Taran Kozun answered the call with 30 saves on 32 shots for the win. Meanwhile, Brendan Burke took the loss with 27 saves on 32 shots. Of note, the Monkeys dressed just 19 players due to a rash of injuries. Oct 04 Concordia at R.M.C. The game stories from the late game between the Monkeys and Mutts are in. The Monkeys were down to 16 skaters for this rematch. However, the head organ grinder must have offered plenty of bananas to the survivors to get them going for this one. The turning point IMO was during a 2nd period PP situation. The Mutts were down two and went on the PP, during which time the Evil Monkeys scored twice. Game Over. Zach Sawchenko got a turn in goal for the Apes, and faced just 15 shots in claiming the win. Taran Kozun started once again for the Mutts, stopping 30 of 35 shots. Taylor Cooper had 2 goals and an assist to lead the Monkey offence. So the Mutts had to be satisfied with a split, a quick drink from the toilet, and a bus ride back to Saskatown. Oct 6 7:00 CDT at Ralph Engelstad Arena, Grand Forks, N.D.
Oct 7 5:00 CDT at Baxter Arena, Omaha, Neb. This is a bye week in the CW. But the Bisons, Lethbridge, Mount Royal, and Alberta are headed south for games against various NCAA teams. All trips are Saturday/Sunday format. For the Bisons, they are off to play two teams from the NCAC. It is a strong conference. Last year UND defeated UNO in the quarter-finals. Omaha is coached by Mike Gabinet, former coach of the NAIT Ooks. UND is ranked 11th in one poll, and 12th in another. 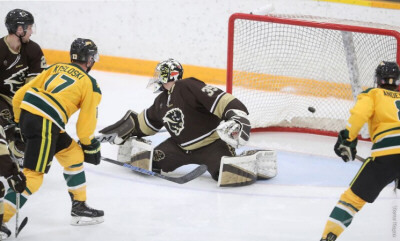 In this week's news, there are three stories linked from GoBisons.ca. First, rookie Devon Skoleski was the male UofM athlete-of-the week, based on scoring in both games last weekend. Second, the 123 Bison athletes to be recognozed as Academic All-Canadians beats the previous UofM record of 117. The total includes 8 hockey players off last year's squad. And third, we have a preview story which includes a blurb on the Bison Broads raising their national championship banner on Friday night. Around USports, Dinos' coach Mark Howell will coach the All-Stars against the Team Canada Juniors in December. And UNB was ranked #1 in the first Top Ten. Oddly, York got votes after going 0-3-0 on their trip to Sask. The Hørny Ønes seem to be a trainwreck in the making. At least they are playing two teams with sub-.500 records from a year ago. The Bluegars draw probably the best combined records of their opponents award this weekend. Why on Earth would a team from St. Cloud use a Montreal Canadiens' logo? The Evil Monkeys usually don't do these tours. They probably wish they had a bye week right here so they could rest their injuries. They were down to 16 skaters last weekend. Oct 06 Laurier at R.I.T. The Fighting Hawks, or Suddenly-Peaceful-Sioux, built a 2-0 lead, lost it in the 3rd period, then won it on a PP goal in overtime. That's the abridged version. The UND website is not what it used to be. At one time they provided links to legible boxscores or summaries, video highlights, and a game story or two. Now their team links for live stats were trash. In some ways, it was even worse than that pathetic rubbish put out by USports. The version of the live stats page was totally different if viewed on a desktop, tablet, or cell phone. There were no lineups on the desktop version, for example. Byron Spriggs stopped 52 of 55 shots, to be named 1st star. Uniquely, both Bison goals were scored by players of the hard-nosed variety, Thomas Lenchyschyn and Jonah Wasylak. This was Wasylak's first game back in over a year. The extra defenceman dressed for the Bisons was Brandon Paradoski. He went to St. Paul's then played Junior B for the Selkirk Fishermen and then MMJHL for the Seven Oaks Raiders. I guess that since Sean Christensen has done so well, the team is somewhat less afraid to dip into the MMJHL for a depth player. I'll have to do full profiles of the new recruits brought in after the recruiting season had apparently ended. 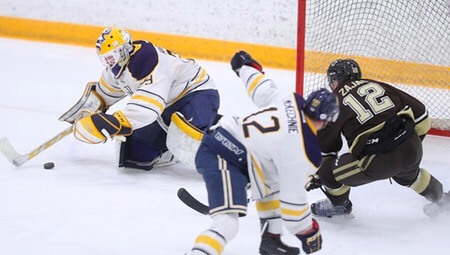 This photo of the overtime winner also gives us a glimpse of the new Bison dark uniform. The Bluegars have two strong opponents this weekend. They were outshot by a 43-17 margin on the night. The Hørny Ønes were outshot 47-11. Still fairly typical result one would expect for them. The Monkeys had a 3-2 lead in the 2nd period but then fell apart. They outshot the Sandwiches 40-34 on the night. Once again, the Monkeys did not dress a full roster. Steve Owre scored twice to lead the Primate offence, and Zach Sawchenko picked up the loss in goal. The Bisons ventured further south for game two of the weekend and had a tough night in Omaha. Brett Brooks scored their only goal. Byron Spriggs did not suit up, leaving goaltending to be split between Justin Paulic (stopping 28 of 32 shots) and Dasan Sydora (stopping 22 of 24 shots). Hopefully those scratches will recover in time to face the Monkeys in next weekend's home opener, Friday and Saturday at 7:00 p.m.
Paulic played two periods, Sydora played the 3rd. There were also two additional Saturday night picture Tweets posted. Here they are, with a sample picture. Captain Stovin in action Saturday at UND. The Bluegars seemed to have been dominated in this one, being outshot 40-17 on the night. The Hørny Ønes were off to a 2-0 lead before the Bullfrogs turned the game around with five unanswered goals. I guess that getting a 2-0 lead in the first place marks a step forward for the U-Cup hosts. No shootouts in the NCAA. After the OT was done, this one was called a draw. The Monkeys went with Kenny Cameron in goal. They were outshot 16-3 in the 1st period, but the game was still scoreless. In the 2nd period, the Monkeys scored two early goals and outshot Air Force 16-11. However, they could not hold the lead and left the USA kissing their sisters. Oct 12 Mount Royal at U.B.C. Oct 10 Moncton at U.P.E.I. Oct 10 Acadia at St. F.X. The Rutherdump is disappearing and the whole CW, not just the UofS, is thrilled about that. Rust falling from the rafters ought to have been the final straw years ago. The big difference as far as hockey is concerned is that the ice surface will be full size, not the mini-ice the Huskies have been used to having. Will this prompt the recruitment of smaller players, and better skaters? I also see that it will have indoor plumbing, a rarity in Saskatown. This week in the CW features a quirk in the schedule in that all the teams who went 1-1 in the opening round face one another, the two 2-0 teams face one another, and the two winless teams also face one another. In this matchup between the Bisons and Evil Monkeys, the teams (on the surface) have had similar runs the last two weeks. Both started the regular season with a split against a team with a pre-season victory over their opponent (Calgary split with Manitoba and beat Alberta in pre-season, and Sask did the same in reverse). Both were 0-1-1 in the USA last weekend (albeit the Monkeys had a tie, not an OTL). One issue to observe is both sides' line-ups. Last weekend the Bisons were without Zach Franko and Kamerin Nault from their first line, and the Monkeys were without their whole top line. With so many new players, an dmost coming from Junior A, the Bisons lack depth in comparison to the Monkeys. In disappointing news, Findlay's “Tuesday Morning Skate” and podcast are now at the Usports site, instead of CUSN. (Why couldn't it be at both?) Since the Usports site is trash, it might be hard to get it. We'll see. This will be an interesting match-up between two sides who took last weekend off. Both were impressive on the Friday night of the opening weekend before crashing to Earth on Saturday. Sask had the best pre-season in all of the CIS (USports). Is Calgary a true contender, as pundits speculate? Or are they better viewed in a group with Manitoba, UBC, and MRU? This is a golden opportunity to get a win! IMO, Regina has recruited fairly well the last two years and are not terrible. They're just not as good as the top 6 teams in the CW. Lethbridge had some off-season turmoil but it seems like they are not far off of last year's pace. This is the battle for first place! However, unless the schedule changes to give these teams lots more games against Regina and Lethbridge, I don't see this holding. Realistically, these two are aiming to solidify a playoff berth and then shoot for home ice advantage in the quarter-finals. Oct 12 Queen's at U.O.I.T. Oct 12 Carleton at R.M.C. Oct 13 R.M.C. at U.O.I.T. Oct 13 New Brunswick at U.P.E.I. After the conference bye week and the end of non-conference play, the teams of the CW got down to some hotly contested games Friday night. Included was a dandy game at the Wayne Fleming Arena where a boisterous crowd, which included the Engineering Symonized Marching Band, cheered the Bisons on to a win over the Evil Monkeys. The Herd is now 2-1-0 and tied for 2nd place, whilst the Primates are 1-2-0 and tied for 5th. For the first time in a while, Alberta iced a full roster. Also, the Bisons got back a lot of injured players. The Monkeys amassed a 2-0 lead in the 1st period with a pair of PP goals by Cole Sanford. The preponderance of penalties favoured Alberta. The Bisons turned it around in the 2nd period. Devon Skoleski (with his 3rd) scored on the PP and Brett Stovin (with his 4th) tied it up, as the Bisons outshot Alberta 12-10 in the period. Midway through the 3rd period, Nick Zajac scored his 1st of the season and suddenly it looked like the Bisons could do it. The Monkeys threw a lot of bananas at Spriggs, but he was quite up to the task. The shots were 38-28 favouring Alberta. The three stars were Spriggs, Zajac, and Sanford. This was a tight battle to christen the new Merlis Belsher Place in Saskatown. So a shootout seems appropriate. I saw the ending on CanadaWest.tv after getting home from the Bison game. Lots of crazy penalties and aggressiveness. Saturday's rematch should be quite the tussle. Taran Kozun got the win (29 saves) and Jordan Papirny took the loss (46 saves). There were eight different goal-scorers. The Banjocats scored with 93 seconds left to tie the game and there was much joy amongst the Feline Hillbillies. But the H0rny Ones Scored again with just 4 seconds left to claim the win. Lethbridge was only able to dress 16 skaters and two goaltenders. Garret Hughson made 31 saves to claim the win, and Dawson MacAuley had 28 saves in the loss. Lethbridge vaults out of the basement with the win, at 1-2-0, and Regina is 0-2-1. This was the only 2-goal loss of the night in the CW, and the last goal was into an empty net. Rylan Toth got the win, with 35 stops on 36 shots. Colin Cooper suffered the loss, with 32 saves on 34 shots. Austin Vetterl had two goals for the T-irds, including the empty-netter. The Monkeys got off to a quick start, leading 3-0 after the 1st. The Bisons attempted to rally but to no avail. Mackenzie Dwyer scored for the Bisons. Zach Sawchenko got the win with his 19 saves. Byron Spriggs took the loss, with 27 saves on 31 shots over two periods. Dasan Sydora played the 3rd and stopped all 9 shots he faced. Both sides are now 2-2-0 and in a 4-way tie for 3rd place. Next weekend the Bisons host Regina and the Monkeys visit the Bluegars. 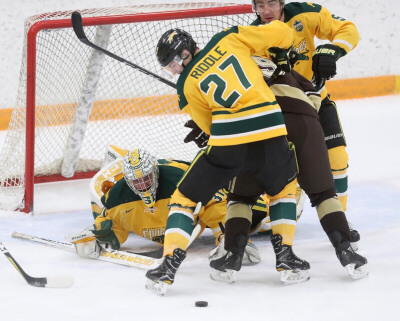 Five different players scored once each to help Sask earn the sweep. Taran Kozun stopped 15 of 17 shots for the win. Bedrock U switched goaltenders with Matthew Greenfeld getting a turn. He stopped 27 of 30. A sweep for the H0rny Ones! Regina outshot them 43 to 21. But Garrett Hughson was on, and Michael Herringer was not, as goaltending made the difference. The last one was into an empty net, as six different players scored. After an extensive pre-season, every team in the CW has now hosted and travelled for a weekend series. 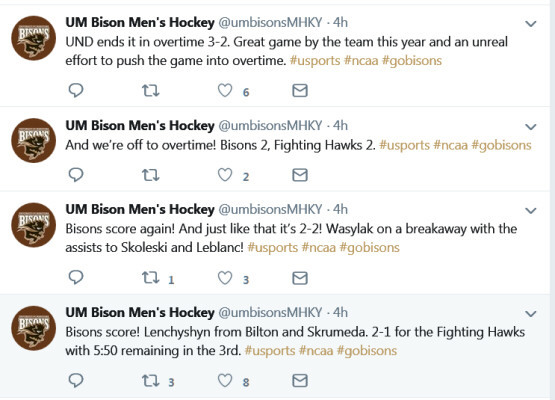 The Bisons had a marginally sub-standard exhibition record, but a split in the Town of Bedrock followed by a split against the Evil Monkeys is the envy of most teams in Usports. All told, the Herd is tied for 3rd place with three other teams. Regina, meanwhile, are not a bad team but the best they could manage thus far is an OTL in games against MRU and Lethbridge (the teams who were 6th and 7th last year). Being swept at home by the Hørny Ønes is not part of the recipe for success. In the recent past, the Bisons have had the Cougars' number. The Bisons beat the Banjocats 5-2 in a September exhibition game, made to look close when the 'Cats scored a late goal. In 2017-18, the Bisons were 4-0-0, with Regina getting one point for an OTL. Over the past 4 years, the Bisons are 14-1-1 (Regina is 2-13-1) in head-to-head games. Regina's top four scorers include two veteran defencemen: Tyler King (2-2-4) and Landon Peel (1-2-3). The other two are rookie forwards, Arthur Miller (1-2-3 in 3 games) is hoping to write a story called “Death of a Playoff Drought”, and Connor Chaulk (1-2-3) has done well. Last year's rookie-of-the-year, Zak Zborosky, missed the opening weekend and has one assist in two games. Goaltenders Dawson MacAuley (4th year) and Michael Herringer (2nd year) have split the duties thus far. They have both had their moments. Herringer wound up 4-12-0, 5.11 GAA, .863 S% last year. This year he's 0-2-0, 5.01 GAA, .833 S%. At this early stage, four points gets a guy tied for 7th in conference scoring, and the Bisons have four forwards in that group. Brett Stovin (4-0-4) used to get mostly assists, veterans Brett Brook and Nick Zajac are both 1-3-4, and newcomer Keaton Jameson is 0-4-0. Another newcomer, Devon Skoleski, is off to a 3-0-3 start. 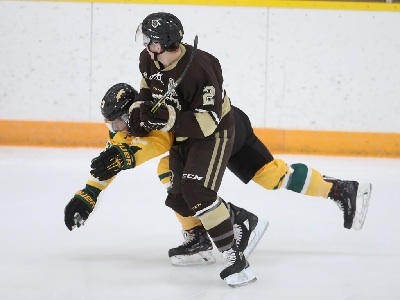 Defenceman Lucas Skrumeda was off to a great start and also had somepoints (1-2-3 in 3 games) before being injured on a hit from behind last Friday. When all is said and done, Regina will steal some points from various teams this season. The Bisons will hope it starts next week. UBC is off to a 4-0 start, but this is the weekend where things get real. The Dinos knocked off the T-irds in last year's playoffs. I suspect that Bedrock U is on their way to a top four finish. However, they need to win series like this one to get there. The Friday game starts at 11:00 a.m. MDT, as part of a school promotion. The Banjomutts' position in this series is akin to the Bisons' position in the Regina series. Having played Alberta and Calgary, they are off to a 3-1-0 start. But points lost here could damage them down the road in the race for a top-two finish needed for a bye to the semi-finals. The Monkeys are vulnerable right now. In pre-season they split with UBC (albeit with an OTL) then split a 3-way round-robin against Calgary and MRU. In the regular season they split with Sask and Manitoba. The Bluegars, in turn, were swept by UBC and swept Regina. In this home-and-home series, it could be said that the Bluegars should feel the pressure to not just steal a point, but to get a split like everybody else. Oct 19 Brock at R.M.C. Oct 19 Windsor at U.Q.T.R. Oct 19 Ryerson at U.O.I.T. Oct 20 Windsor at U.Q.T.R. Oct 20 Guelph at R.M.C. Oct 20 York at U.O.I.T. Oct 20 Dalhousie at St. F.X. This was the proverbial "trap game" for the Bisons. The intensity level was half (or less) than it was for the Alberta series a weekend ago. Combined with a series of bad bounces and a hot goaltender and just like that the Banjocats have their first win of the season. The 1st period was a quick pace with lots of shots but no goals, Regina holding a 16-13 lead in shots. While still scoreless in the 2nd period, the Bisons started to take control of the game and went to the PP. However, Kitten Zach McPhee drifted what should have been a non-dangerous shot past Byron Spriggs. Arthur Miller completed the story of the 2nd period by making it 2-0 on a nice passing play flowing from an Adam Henry turnover. The 3rd period got off to a rough start. Brandon Paradoski, making his first start in a regular season game, was knocked down in the corner and rather than hold the puck, he passed it into the slot directly to Regina's Corey Kosloski. That made it 3-0, and sent the Bisons into scramble mode. Lots of chances were generated, but only Brett Brooks notched a goal. Bad give-aways were the theme of the night for the Bisons. There were at least a half-dozen glaring ones. In the end, Dawson MacAuley's 36 saves led to Kittens to their first win of 2018-19. The rematch goes Saturday at 2:00 p.m. There goes the unbeaten season for the T-irds. The 11:00 a.m. start time did not allow the British Californians time to wake up. Bedrock U outshot them 17-4 and outscored them 3-0 in the 1st period. Jordan Papirny got the win, and Rylan Toth was tagged with the loss. The Evil Monkeys had a narrow escape in this one. The Bluegars are having tough luck, so it will seem. I might have to watch the replay of this on CanadaWest.tv. Zach Sawchenko stopped 16 of 19 shots for the win, and Colin Cooper stopped 22 of 26 shots for the loss. Luke Philp had two goals for the Apes. The Banjomutts are clearly off to the best start in the CW. Garret Hughson stopped 49 of 54 shots in taking the loss for the Hørny Ønes. Taran Kozun faced just 13 shots for the shutout. He could have been selling dog biscuits in the stands. The Bisons started this one dominating the Kittens. Kamerin Nault and Adam Henry scored 1st period goals to give the Herd a 2-0 lead heading to the intermission. They managed to amass the lead despite being shorthanded 3 times. The Bisons started shorthanded in the 2nd as well, but the 2-0 lead lasted until 15 minutes into the 2nd period. Dasan Sydora got his 2nd start of the season and held the fort. But the 18 shots he faced made a goal inevitable. Both goals were scored by defencemen (Tyler King and Brennan Riddle). The 2nd goal sailed over Sydora's right shoulder from the blueline. Sometimes you see why goalies these days are over 6 feet tall. So with the game tied heading to the 3rd period, the Bisons couldn't get a break. They were given 3 more penalties and were quite outraged over non-calls, such that one of the penalties called on them was a bench minor. In any event Zak Zborosky nothced himself a natural hat-trick to start the 3rd period to turn the game around. The Bisons launched some intense pressure of their own at the end but an empty net goal stopped the comeback. I believe that Brooks was injured early on and I only noticed him once. Dawson MacAuley stopped 18 of 21 shots for the win, and Sydora stopped 34 of 39 in the loss. Kamerin Nault had two goals for the Herd. The Bisons fall to 2-4-0, and the Banjocats jump to 2-3-1. The Bisons are away to MRU next weekend. That illusory 4-0-0 start for the T-irds has come crashing down. The standings in the CW have tightened up considerably this weekend. Patrick Dea stopped just 19 of 27 shots for the T-irds and Matthew Greenfield stopped 29 of 31 for the win. Three Dinos scored two goals each (Mitch Cook, Bradley Schoonbaert, and Chris Rauckman). The Monkeys scored with just 14 seconds left to force overtime, while on a PP and with an empty net. So two OTWs for the Apes gives them a somewhat deceptive 4-2-0 record. Kenny Cameron stopped 18 of 20 shots for the win, and Colin Cooper stopped 37 of 40 shots for the loss. Curtis Miske's winning goal was his second of the game. Taran Kozun had 12 saves for his second consecutive shutout. Taz Burman stopped 55 of an incredible 59 shots for the loss. Garrett Hughson came on to play just over a minute and stopped two more. That's a lot of shots for the Hørny Ønes to allow. Levi Cable scored twice for the Mutts. Every now and then there comes a story about the return of hockey to Newfoundland. Here's the latest! When M.U.N. was known as the Beothucks they played local senior hockey until 1968-69 when they joined the AIAA (forerunner to the AUS). They returned to senior hockey in 1976-77 to 1978-79, and then were back to the AUAA (as it was then called) for three more seasons until folding the program. Jan 4: HAPPY NEW YEAR! Unfortunately, after I bounced back from my own off-season surgery, the death of my business partner forced me to relocate in October. This left me no time at all for recreational internetting. I still went to the Bison home games, but there was no time to write about them. Did the Bisons ever fall apart during my internet absence. The big problem has been injuries. They usually had a short bench, and generally by two players. I have the impression that some players, though dressed, would not have been had options existed. In past years they could have overcome this. However, the early departure of some top-end and mid-range players meant that some Junior A bodies had to step in to key roles, rather than the support roles normally given. How will they fare in the second half? Well, technically the second lap around the schedule started just before the break, and the Bisons split with Calgary. Decent enough. But now its time for the annual trip to Edmontown to face the Evil Monkeys. The first thing I noticed was that there were just 16 skaters dressed, including a new recruit. Colton Veloso came from the Jacksonville Icemen of the ECHL. Last year he played for the Kootenay Ice in the WHL and scored 25 goals. He seems to be a skilled player and a strong addition. Tonight’s game was not as good as the two games played at the Fleming Arena in the first half. The Monkeys outshot the Herd 50-13. However, in the 3rd period with the score 2-1 the Bisons went on the powerplay and generated some decent chances. A turnover gave the Apes an insurance banana just as the penalty expired. An empty-netter at the 20:00 minute mark of the 3rd (isn’t that when the game is over?) made it 4-1 to enhance the scoreline. Zach Sawchenko got the win, and Byron Spriggs took the loss. Riley Keiser, Jayden Hart (with two, including the ENG), and Trevor Cox scored for the Monkeys. Jonah Wasylak had the Bison goal, on a nice break-out play with assists to Zach Franko and Adam Henry. In a scheduling oddity, the entire CW schedule is being played in Saudi Alberta this weekend. Moving south, we go to the Town of Bedrock. The Mutts are in first place, and Bedrock U is in the third, so this figured to be a good one. This was very defensive. The shots were 12-8 in favour of the Dinos after two periods, though Sask held a 1-0 lead. Carson Stadnyk scored twice for Sask (his 9th and 10th goals of the season) in the 3rd to put the game away, once short-handed and one empty-netter. Taran Kozun got the win, and Jordan Papirny took the loss. This was a surprisingly easy win for the Bluegars. They outshot UBC 9-1 in the 1st period (!!!!) and 14-6 in the 2nd en route to a 3-1 lead. The T-irds picke dit up in the 3rd periodbut it was too little, too late. Ryley Lindgren scored his 8th and 9th of the season for MRU. Riley Morris got the win, and Rylan Toth giot the loss. The Hørny Ønes have got it going this year, relatively speaking. This would normally be an epic battle of cellar-dwellers. Instead, this was a 55-37 shot clock shellacking. Sam McKechnie scored twice for Lethbridge, Garret Highson got the win, and Dawson MacAuley got the loss. Jan 05 Saint Mary’s U.P.E.I. 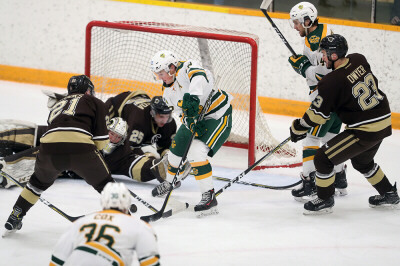 After being dominated on Friday night, the Bisons were able to bounce back with a solid performance that would have been enough for two points against most teams in Usports. Liam Bilton was back in the line-up, meaning that the Bisons were only short one body. Byron Spriggs took the loss, with 30 saves on 35 shots, and Kenny Cameron stopped 23 of 27 shots for the win. Next weekend the Bisons will host the MRU Bluegars next Friday at 7:00 and Saturday at 2:00. The Mutts had a hard time generating offence again. All they managed was 19 shots ibn being shutout by Matthew Greenfield. In their net, Taran Kozun stopped 26 of 29 to take the loss. Dane Gibson had his 6th and 7th of the season for Bedrock U. The T-irds’ hot start is well in the rear-view mirror now. Their only goal was mid-way through the 3rd period when trailing 5-0. Riley Morris got the win (with 25 saves) and Patrick Dea got the loss (with 24 saves). The Hørny Ønes picked up a convincing sweep on the weekend. Amazingly, they were outshot 47-41. Justin Valentino had 2 goals and 2 assists to lead the Lethbridge offence. Garret Hughson had 46 saves for the win, and Dawson MacAuley had 35 saves on 41 shots for the loss. The first two periods were totally different. In the first, MRU scored twice and outshot the Herd 14-7. Jessie Lees and Chris Gerrie had the Bluegar goals. The Bisons turned it around in the 2nd, dominating territory and the shot clock 15-5. However, a bad line change and a fumble at the offensive blue-line led to a 2-on-1 breakout and a 3-0 lead for the Bluegars. Brad Kennedy converted Mitch Lipon's steal of the puck. Then a Bison goal was waved off due to a premature whistle. It looked like one of those nights. Then came a Bison PP due to a routine trip, followed shortly by a 4-minute high stick to the mouth of Nick Zajac, and a too-many-men-on-the-ice call. During those, Zach Franko scored twice in 5-on-3 situations. With a comeback win a distinct possibility, the Bisons never mounted too much pressure in the 3rd. The shot stats said it was 13-9 for MRU, but it didn't seem like it. Nobody had a great shot on goal. Riley Morris got the win, with 29 saves on 31 shots. The rookie is 8-1-0, 1.80 GAA, .929 S%. Impressive! Byron Spriggs stopped 27 of 30 in the loss. The rematch goes Saturday at 2:00 pm at the Wayne Fleming Arena on campus. Usually the Undercats on home ice can at least throw a scare into their fellow bumpkins, but not tonight. The shots were 40-12, favouring the Mutts. Sam Ruopp, Collin Shirley, and Alex Forsberg had two goals each for the Banjo Mutts, and Carson Stadnyk scored his 11th of the season. Back-up goaltender Travis Child got the win, and Dawson MacAuley took the loss. Perhaps the moonshine and banjo music will flow in Saskatown for the Saturday rematch. This home-and-home series was played on a Thursday-Friday format. The Thursday game in Lethbridge drew 1,600 Hørny Fans! That game was 0-0 for over 53 minutes, despite Bedrock U holding a commanding 38-17 lead in shots. The final goal was an empty-netter. Jordan Papirny got the win and Garret Hughson took the loss. Friday's rematch was more of a replay. The shots were 39-16 in favour of the Dinos. In this one, Matthew Greenfield got the shutout win and Garret Hughson once again experienced defeat. The T-irds gave the Evil Monkeys a scare in this one. Though being outshot 38-28, it was close throughout. There were four minor penalties (none coincidental) in the overtime, two each. Zach Sawchenko got the win and Rylan Toth got the loss. Jan 12 New Brunswick St. F.X. This was a game that could have gone either way. Once again, it was an empty-net goal which altered the scoreline at the very end. On the night, the shots were 30-29 in favour of the Bluegars. There were no line-up changes from Friday night, but for MRU scratching Jamal Watson in favour of Luke Simpson, who I did not notice taking a shift. The Bisons came out like they were shot out of a cannon. Liam Bilton notched his 4th of the season. MRU took some penalties for hits from behind, one of which knocked Zach Franko out of the game. Since they were already one forward short, the loss of one more made it a 3-line game the rest of the way. Byron Spriggs got the loss, with 26 saves on 29 shots and Riley Morris got the win with 28 saves on his 29 shots. Morris the Cat is a good goaltender. The loss leaves the Bisons 8 points behind Lethbridge for the last playoff berth. Next weekend the Bisons play Regina whilst Lethbridge faces Sask. After that, the Bisons host Lethbridge. Had the Bisons beaten MRU once, they would have had a great chance to vault into a playoff position in two weeks. Taran Kozun stopped 25 of 26 shots for the win, as 5 different Mutts found the fire hydrant. Dawson MacAuley took another loss, with 34 stops on 39 shots. More disappointment for the Banjo Cats! After a scoreless 1st period, the Evil Monkeys did a number on the T-irds in the 2nd period, outscoring them 4-0 and out-shooting them 14-2. Zach Sawchenko had a 17 save shutout for the win and Luke Philp scored his 13th, 14th, and 15th goals of the season. Rylan Toth stopped 20 of 24 shots for the loss, and Patrick Day stopped 9 of 11 in relief. This was a battle-for-the-basement, but the win keeps the Herd's hopes alive. They close to within 6 points of Lethbridge, who play Sask today and the Bisons next weekend. With Zach Franko out with injury (joining a long list), the Bisons at least recovered captain Brett Stovin for the injured list. They also debuted a new defenceman, Ryan Carlson, a transfer from Wisconsin-Superior. 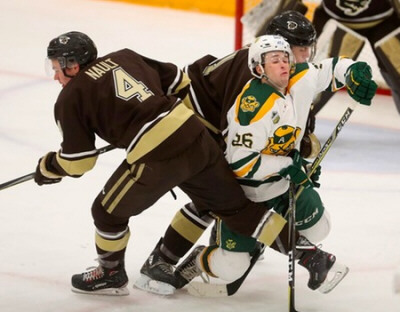 Matthew Leblanc scored his first goal in the CW for the Bisons, and he Devon Skoleski (goal and assist), and Jeremey Leipsic (two assists) each had two points on the first three goals. It's always good to get some depth scoring. Defenceman Lucas Skrumeda also had a goal in that mix. Liam Bilton and Nick Zajac added empty-netters. Byron Spriggs stopped 27 of 29 shots for the win, and Dawson MacAuley stopped 38 of 41 in the loss. The rematch goes Saturday at 3:00, and hopefully canadawest.tv is up and running. Host Yare was doing site maintenance on Friday night just before 8:00, during the busiest night on the CW schedule across all sports. Bad timing. The Bisons got the help they needed from the Banjo Mutts. This was a penalty-filled affair. I wish that I could have seen the shenanigans on CanadaWest,tv. A loss tonight by the HØrny Ønes would open the door for the Bisons to be in a playoff position next weekend. The Evil Monkeys dusted off the Bluegars in convincing fashion. Shots were 38-17. Brendan Burke was back in goal for the shutout win and Graeme Craig scored twice. Riley Morris took the loss. This was the annual Winter Classic out in British California, so they had a huge crowd. But the glory went to the team from the Town of Bedrock in overtime. Jordan Papirny got the win with 18 saves on 20 shots, Rylan Toth took the loss with 28 saves on 31 shots. The slumping T-irds needed at least that point. Could they be the team that slumps right out of the playoffs after their amazing start? The last two Cougar goals were scored into the empty net, so the scoreline (like on Friday) was a bit deceptive. On the night the Bisons outshot the Kittens 40-31. Matthew Leblanc scored his 2nd goal of the weekend (and of the season!) and a pair of goals by Jonah Wasylak gave the Herd a 3-1 lead in the 2nd period. Then things fell apart. Two goals by Zak Zborosky tied the game before the 2nd period ended. Brandon Holtby stopped 24 of 26 for the win, in relief of Dawson MacAley, who stopped 13 of 14 in the 1st period. Byron Spriggs took the loss, with with 25 saves on 29 shots. 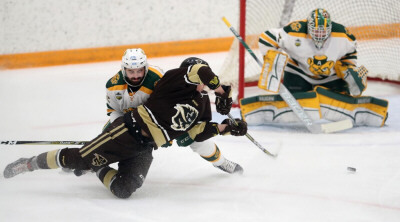 The loss blew a golden chance for the Bisons to close to within 4 points of Lethbridge in the race for the final playoff spot. Yet another loss by the HØrny Ønes keeps the Bison hopes alive. There was a lot of ebb-and-flow in this one. Lethbridge scored first, Sask scored four unanswered, then Lethbridge scored three straight themselves. A late 2nd period goal gave the Mutts a 5-4 lead heading into the 3rd. Oddly, nobody could score in the final 20. Taran Kazan stopped 21 of 25 for the win and Garret Hughson stopped 36 of 41 in taking the loss. The scene switched to the home of the Bluegars but in the end the scoreline was identical to Friday night. Zach Sawchenko had a 21 save shutout for the win, and Colin Cooper stopped 16 of 20 through two periods for the loss. Riley Morris stopped 7 of 8 in the 3rd period. The Evil Monkeys had 4 goals on 6 shots in the 2nd period. This double-OT win secured a playoff berth for the T-irds on a weekend where each team gained 3 points. Patrick Day got the win with 22 saves of 25 shots and Matthew Greenfeld stopped 31 of 35 for the loss. Jan 22 St. F.X. at U.P.E.I. Jan 25 U.P.E.I. at St. F.X. Jan 23 Queen's at U.O.I.T. Jan 25 Ottawa at R.M.C. This was a loss the Bisons could ill afford. Yes, they outplayed the Horny Ones (shots were 41-30) and no team led by more than a goal until the empty-netter. But the lack of finish hurt them, as usual, especially with Zach Franko i9njured and Kamerin Nault gone. Liam Bilton, Jereemey Leipsic, and Adam Henry (shorthanded) scored for the Bisons. The powerplay was 0-for-4, and that might have been the difference. Brooks Maxwell, Blake Orban, Sam McKechnie, Ryan Chynoweth (with obne minute left), and Jeff Rayman (into an empty net) scored for Lethbridge. Garret Hughson got the win and Byron Spriggs got the loss. With an afternoon game following a night game, I need to leave and I'll give a weekend wrap-up later on. By the way, it was Bell's Let's Talk night and everybody got a free toque. This was a whippin'. Shots were 41-17. UBC's hot start is firmly in the past. They are nowhere near being a threat on the national stage. Taran Kozun got the win, and Rylan Toth the loss. Kohl Bauml scored a pair for the Mutts. The Evil Monkeys had a much easier time with the Banjo Cats than they had with the Bisons. Shots were 52-17. Yikes, life in the Regina net is hazardous. Brenbdan Burke got the win, and Brandon Holtby the loss. Luke Philp scored four goals for the Apes, giving him 20 (!) on the season. This was a tight defensive game (shots 22-19 for Bedrock U) in this preview of the Crowchild Classic coming up Tuesday at the Saddledome. Jordan Papirny got the win and Riley Morris got the loss. With their backs to the wall, the Bisons achieved a very thorough victory to stay alive. A win by the Hòrny Ɵnes would have ended the Bison playoff hopes. As it stands, the Bisons end the weekend 6 points in arrears. The Bisons were leading the game 4-0 after two periods and held a 31-21 lead in shots, and it seemed that Lethbridge had far fewer shots than in the official total. The only goal in the 1st period was originally awarded to Adam Henry, and as I post is still listed as such in the stats. However, at the arena they announced during the intermission that it was awarded to Brett Stovin. Stovin scored twice more (including an empty-netter) while Jonah Wasylak (suddenly a goalscorer) notched his 6th and newcomer Colton Veloso racked up his 1st. Russell Maxwell was the only one to score, breaking up Byron Spriggs' shutout bid mid-way through the 3rd. Spriggs got the win with 35 saves. Oddly, he had to come out for 4 seconds early in the 2nd period after the officials had a discussion. Garrett Hughson made 27 saves through two periods for the loss, before Taz Burman mopped up. Note: On Friday, Lenchyshyn did not dress but #23 Dwyer did. Although Dwyer was listed on Saturday, I did not see him on the ice at all. Note: On Friday, #18 Armour also dressed and played on a 4th line. On Saturday Martin and LeBlanc were generally used to sub-in on other lines after the PP or PK units were out there. Note: The lines were the same both nights. Next weekend the Bisons are off to British California whilst the Hòrny Ɵnes have the unenviable task of a road trip to Edmontown to face the Evil Monkeys. My hunch is that the Bisons will have an opportunity to close to within 2 points. Will they take advantage of that opportunity? The T-irds have had a serious power shortage. Perhaps they had too much Hillbilly Moonshine. Back-to-back shutouts are bad news. They do have a playoff berth assured but still aim for 4th place, and the opportunity to host a quarter-final series for only the 2nd time in the colour TV era. Taran Kozun registered a 24 save shutout, and Patrick Day had a 28 save loss. The Evil Monkeys destroyed the Kittens in this one. The shots were 60-13. Zach Sawchenko picked up the win with just 12 saves. Dawson MacAuley suffered a 53 save loss. Tyler Soy, Grayson Pawlenchuk, and Jayden Hart had two goals each. Feb 01 Manitoba at U.B.C.